A wedding is a big day that's unforgettable for any couple. Photos can help to preserve these bright moments of love and happiness for years to come. After a wedding, newlyweds are left with a flurry of photos — some taken by professionals, others by family and friends. Usually, their favorite or most beautiful photos are printed and made into a wedding album. The other photos are kept on the computer and viewed rarely, if at all. How can such a huge number of photos be combined, while making something out of the ordinary? Artensoft™ offers an interesting solution: create a photomosaic based on the newlyweds' photos from their wedding. That means that you can include ALL of their wedding photos in one image. Look at a photomosaic and see the whole wedding! The wedding photomosaic can be printed, framed, and given to parents or friends. 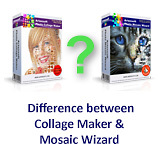 If you don't want know what to give for a wedding anniversary, or want to surprise your spouse with an original gift, Artensoft Photo Mosaic Wizard is just what you need. The program couldn't be easier to use: just select the main photograph and load a collection of photos that will be used to make the photomosaic. If you don't have enough photos, then you can add other ones to the wedding photomosaic: photos of the newlyweds together from before the wedding, or the bouquet, procession or cake at the wedding, and so on. The more snapshots you have, the more interesting and beautiful the photomosaic will be. Download the program for free here! The program also allows you to see the results for yourself before you pay.